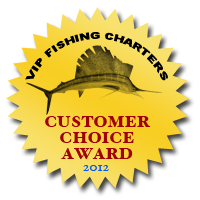 Our Fort Lauderdale full day fishing charters are 8 hours long and leave from our docks in Fort Lauderdale. If catching a ton of fish and having the most fun is what you're after, then our Fort Lauderdale full day fishing charter is right for you. Having a full day lets us do a ton of different type of fishing and get far offshore where we find the big boys! Even though plenty of great fishing can be done close to shore in Fort Lauderdale, having the ability to travel offshore opens up a ton of options. And it's no secret... fishing in Fort Lauderdale is like everywhere else... big fish like deep water! On one our full day fishing charters in Fort Lauderdale we can experiment with different types of fishing. We can chase mahi mahi offshore, search for swordfish, troll for sailfish, snag some grouper and snapper on wrecks, and more. Having the extra time makes a big difference. We generally do not recommend our full day charter for young anglers or those who have never been fishing before. It's probably better to do a 4 or 6 hour trip and then if you're having a good time and we don't have another charter booked, we'll be happy to extend the trip for a few extra hours and just charge you the full day rate. Our Fort Lauderdale fishing charters are nearly all inclusive. The only thing not included in our price is live bait and gratuity for the crew. Contact us to today to plan your full day Fort Lauderdale fishing charter with us.